On the first Sunday of every month we celebrate Holy Communion, to which all are welcome. In our worship we seek to be encouraging and challenged in Jesus for the renewal in the Holy Spirit in heart, body and mind. We value open, generous and inclusive worship, the sharing of communion, the exploration of scripture and prayer for each other and the wider world. We aim for worship reflecting truth, beauty and goodness. Our vision is to be an inclusive and affirming community, sharing creatively the fullness of our life in Christ. The Christ Church Wayville congregation began as the Unley Methodist Church – tributes to this history can be found in our building’s stained glass windows and in some of the memorials located on site. The church building was designed to cater to the needs of the congregation and those of Parkin-Wesley College. The College has now moved to Brooklyn Park and has since changed its name to Uniting College for Leadership & Theology. The site adjoining the current church property is now used by Eldercare The Lodge, Wayville. This change gave our congregation the opportunity to use the church building more creatively through the Effective Living Centre, which was established in 1998. 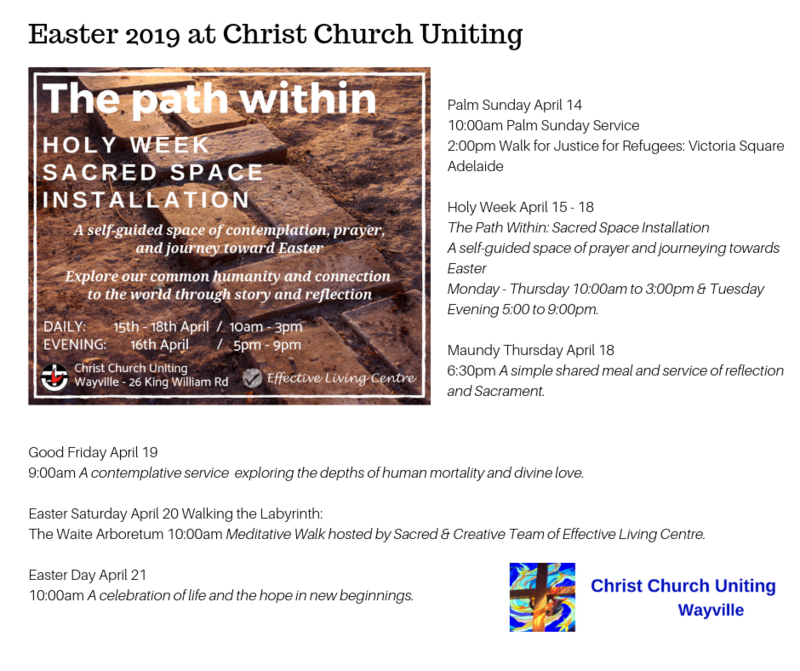 Christ Church Wayville is part of the Uniting Church in Australia, Presbytery and Synod of South Australia. The Effective Living Centre is a mission centre of the Uniting Church SA Mission and Leadership Development ministry centre (formerly Mission Resourcing). *Regular maintenance is required to protect the stained glass windows. Donations are appreciated. 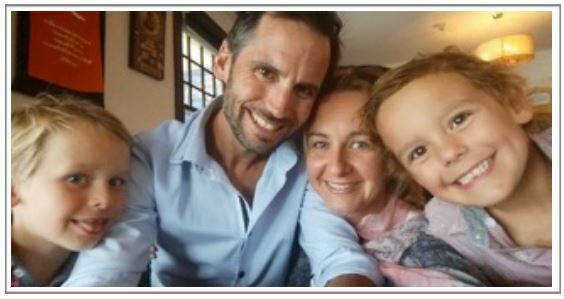 Husband and wife Dave and Sarah Williamson, and their two boys Kaden and Jai, came into our Christ Church community in August 2017. Sarah is a Deacon in the Uniting Church. She has held roles at Keiraview and Kingscliff Uniting Churches. She also served as the Synod of SA Solidarity & Justice Worker for four years from 2011. Sarah believes her “sense of justice to be an insightful gift that speaks into making connections with who we are and who God calls us to be”. Sarah writes that as a Deacon, “I found my ‘home’ in ministering in service, with ‘peace with justice’ and often, for the most marginalised of people”. She also ministers at Belair Uniting Church. Sarah has been installed at Christ Church and now holds a 0.2 placement. We really believe we are very fortunate and will be blessed by Sarah’s service and leadership at Christ Church and the Effective Living Centre. Dave has nineteen years experience across four Uniting Church Synods. Along with Christ Church Uniting, he also holds a 0.5 placement at Oasis – Flinders University. In his own words he has “a love and joy of facilitating meaningful and engaging Christian worship and sacred spaces” and “a commitment to diversity, inclusivity, equality and hospitality”. Dave is also into triathlons with its associated training and competition. We are excited by the gifts and talents Dave will bring to our church and the Effective Living Centre. Enquiries can be made at the Church Office or via phone 08 8271 0329.